Judith was born and raised in Winnipeg, Manitoba. She attended the University of Manitoba and graduated with a Bachelor of Arts, majoring in English literature and Sociology. From 1982 to 1986 she lived in London, England and moved to the Edmonton area in 1992. Judith obtained her Certified Management Accountant designation in 2001. She joined Liu & Associates LLP in its predecessor form of Raymond C. S. Liu Professional Corporation, full time in 2006 and became a partner in 2008. 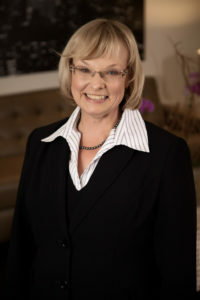 In addition to her work with the firm, Judith sits on the Board of Directors as the Treasurer for the Cantilon Choral Society, and the Alberta Choral Federation. Judith is the proud mother of four grown children, and one German Short-Haired Pointer.